Shown above is a custom Little Love Press fashion illustration portrait of the First Lady Michelle Obama with her daughters Malia and Sasha during their tour of London promoting their Let Girls Learn initiative. The First Lady is in Preen and Malia is wearing a Shoshanna dress. 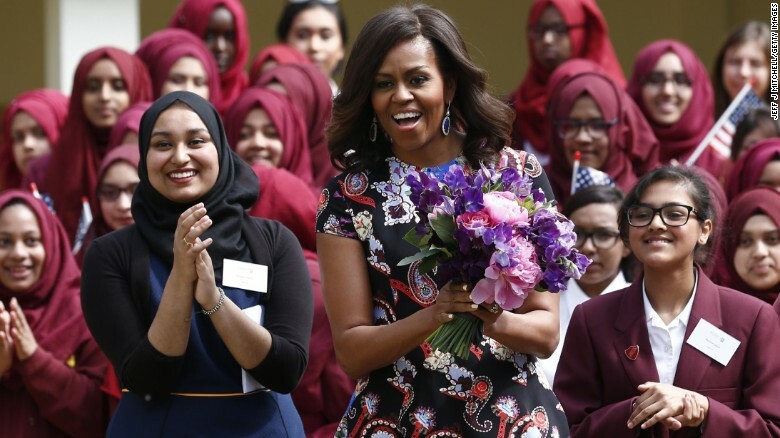 The First Lady, traveling with Malia, Sasha, and her mother, Marian Robinson, made an announcement in London earlier this week that the United States and the United Kingdom will be launching a $200 million partnership to support the education of 62 million schoolgirls in countries such as the Democratic Republic of the Congo. "There are 62 million young women like all of the girls here and around the country who aren't getting an education, and their potential is just being lost. And we can't afford that." The news of the initiative’s partnership has a special meaning for Little Love Press, a supporter of EmpowerKids Foundation. Since its inception, the Foundation has strived to enrich the education of children in underprivileged communities and has made a significant impact in improving the school enrollment and attendance of young girls in India. To learn more about Let Girls Learn, visit the U.S. Agency for International Development’s page dedicated to the initiative.